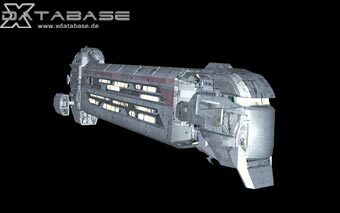 "The purpose of the Express is to act as a passenger transporter for civilians wanting to travel between systems and stations. This was always a problem as passengers travelled in converted Lifter class freighters. But when the lifter was retired from service, it was found the Mercury could not replace the job of transporting people. The Express was constructed by a group of Civilians at Argon Prime out of old planetary transport hulls to transport its workers from one station to another in one go. The Argon Shipyard saw the ship and became interested in its design, which was altered slightly to act as the newest passenger transport ship."